The death of Freddie Mercury remains today a sensitive topic. One of rock music's most versatile and colorful voices has been lost to us for twenty-one years now and we still have no full grasp of who the man really was. Mercury's legacy to not only the music world but the entire human race will always be tied to AIDS and how his tragic passing raised a new level of unease propagating that promiscuity can have lethal effects. The press over the years made Freddie Mercury out to be a licentious vamp of the gay scene, which has all but crippled his standing as an individual, forget his aristocratic position in music. No one will ever take away Mercury's accomplishments from him. Whether you're a QUEEN fan or you appreciate Mercury's solo outings "Mr. Bad Guy" and "Barcelona", the man was a self-motivated force of energy to whatever endeavor he chose to pursue. His voice was bequeathed from an entity higher than any of us. Still, for all of his graces and talents, Freddie Mercury's passing comes with an inevitable caveat that we're beginning to learn really isn't applicable. Heteros have suffered and died from sexually transmitted diseases as much as the gay community has. Sharing body and soul with another mortal comes with that risk regardless of orientation. Yes, the more people you expose yourself to, said risk is elevated. Look at John Holmes. Yet Freddie Mercury, who would've had his fans believe at one time he was the high priest of flaming machismo, was hardly the aggressive boy toy he played out in public. Born Farrokh Bulsara in Zanzibar and relocated to England, the awkward young Mercury pursued his passion for music and soon elevated his stature in the social hierarchy once QUEEN became international superstars. Still, there was a repression of sexuality Mercury lived under which prompted him to move across the pond. When you talk to QUEEN fans from way back, everyone suspected Mercury's sexual preference, but none of it was discussed, not when Mercury was depicted chasing girls in QUEEN's videos, at least through the unchained drag of "I Want To Break Free". Plus he was seen frequently in the company of a female companion, Mary Austin. Only when Mercury relocated to New York City and embraced his homosexuality did the matter crop up amongst the mouths of QUEEN's faithful. Mercury managed to keep his lifestyle sequestered for many years until a former male lover sold him out to the British press. Unfortunately, for all that he gave to the world with his amorous and controlled vocal command, Freddie Mercury was the victim of a wanton lust for love. It forced him to pander to an image that was and wasn't really he who he was. "The Great Pretender" is a heartfelt attempt to set the record straight on Freddie Mercury, even if by the end of the movie, we're still left with a few questions not even his bandmates in QUEEN nor his closest associates can wholly answer. The interview footage of Freddie sprinkled throughout "The Great Pretender" shows the man tugging on a cigarette and mostly relaxing before his host while revealing just enough alpha-omega flirtation without putting his full hand on the table. Laced with cheeky profanity and an omnipresent leeriness, this is possibly the most candid revelation we're going to get about Mercury. You can detect the introversion beneath Mercury's abrupt candor, as much as you can get a feel he was screaming inside despite coming off like a cynical fashionista. It only adds to the sadness of his death, because it was evident the man had so much more to give his audience, even if he was likely wanting to dash into the nearest corner of the interview studio and chain smoke a few more cigarettes in private. In another portion of the film, Mercury openly expresses his detestation for interviews, noting how he didn't like talking to people he didn't know (i.e. trust), this coming from a man who made his home at stadiums and arenas in front of hundreds of thousands of fans, a man who thrived on attention. 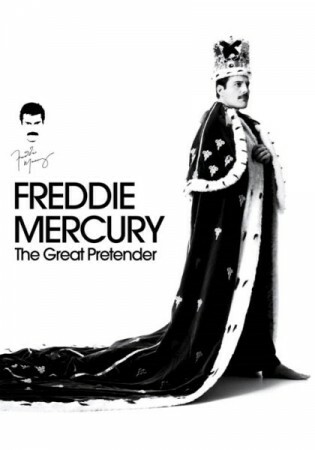 Having covered "The Great Pretender" (made famous by THE PLATTERS) as a proposed side project of remakes, Mercury states that his choice of the song was intentional and it best suits his personality. It's the most honest expos? we have on him. Freddie Mercury wasn't a sham but he apparently felt like one, evidenced by Freddie's self-roasting in "The Great Pretender" video. His sweltering, campy rock lord ethos in QUEEN was a big cover-up that had nothing to do with his choices in love interests. Mercury had a passion for music outside of rock 'n roll which included dance, disco, jazz, classical and opera. He opened up musical ties with Michael Jackson we get to see in demo form here, but story has it Jackson repeatedly brought a llama into the recording studio, which intimidated Mercury from finishing their collaboration. Jackson was part of both the soul and the rock world, and the meeting of two industry giants could've been another high tide point for Mercury's career. Still, Mercury's rock 'n roll affinities were nearly played out, which the man himself insinuates. It's a stretch maybe, but perhaps Mercury was addressing a need to get out of rock and explore his creative nature elsewhere whenever he sang QUEEN's "I Want to Break Free". Certainly Mercury's solo works stray far from the epicenter of QUEEN's grandiose rock titania and "The Great Pretender" examines his mindset in conceiving these projects. While "Mr. Bad Guy" was a commercial flop back in 1985, many of Freddie Mercury's fans swear by it. Mercury quickly wrote the album off as disposable in the back of his mind and prepared to move on. It was once he took in the opera and discovered the mezzo-soprano illumination of Montserrat Caballe when Mercury took his pursuits to a new place and, many argue, to their fullest heights. "Barcelona" fared far much better on the music charts even with the oddity (for its time in 1988) of having a rock singer set in stride next to an opera soloist. Many feel "Barcelona" represents Freddie Mercury at his creative zenith; so much the album is being given an orchestral refinish this year to confiscate the synthetic keys from the original's conception. Sadly, "Barcelona" marks the beginning of the end for Mercury once he learned he'd contracted HIV during its recording. In the overview "The Great Pretender" places before us, we see Freddie Mercury's final years as a heated race to the finish line. He recorded a bounty of songs with QUEEN, represented on "The Miracle" and "Innuendo" albums. A new level of respect comes to those albums upon learning the feverish pace Freddie worked on them to bid his final farewell to the rock theater he governed better than nearly anyone else. "These Are the Days of Our Lives", "I'm Going Slightly Mad", "All God's People" and the band's triumphant swan song "The Show Must Go On", all from "Innuendo", are more refined and more dramatic confessionals in hindsight. "The Show Must Go On" is enough to coax tears, but once you've sat with "The Great Pretender" and understood how Freddie Mercury acted on the front to his anything-goes stage persona yet asphyxiated beneath an inhibited self-estrangement, his story is sadder thus. "The Great Pretender" rights a few wrongs about Freddie Mercury and if anything, we can view his unjust casting as a poster child for AIDS as illegitimate. Perhaps Mercury was made a goat in this sense to curb unrestrained instinct and to consider future consequences for sexual extremism. Mercury's dominant stage presence made for a potent message that was taken deadly serious by both the gay and straight communities. Unfortunately, the powers that be chose the wrong target.